This headline has admittedly been in much use on our homepage, particularly in relation with The Musical Box. Genesis themselves did it rarely on their recent tours – the grand tour throught the band’s history was usually omitted, the reason being new albums that would eat up lots of time in the set. It does seem, however, that Genesis may offer a tad more of their history on their upcoming stadium tour than many expected. We refer not “only” to the set list but to the overall experience. Trade Fair hall #5 on the Brussels Expo area played host to a dress rehearsal. For the first time the complete set was played with a full stage production before an audience. The audience in question consisted of invited guests, fan club representatives, friends and families of the band, people from record companies and promotors as well as assorted folks from companies directly involved with the production. Your men-on-the-spot from the German Genesis fanclub it and Genesis-news.com were Christian Gerhardts, Helmut Janisch and Peter Schütz. While we were waiting to be let in we chatted with representatives of InsideOut Music and Maria Costa of Ultrastar. When we were finally allowed to enter we had to show ID but we were not frisked despite all previous announcements that taking photos would not be allowed. The hall itself is rather long and sports a domed roof like a railway station. Because of the size of the stage it had to be set up along the long side and slightly to the center of the hall. The stage would not have fit into the hall any other way because of its height. The part of the stage on which Tony Banks, Phil Collins, Mike Rutherford, Daryl Stuermer and Chester Thompson play their music is smaller than on previous tours, the band moves together, as it were. Behind them there is a modern spectacular structure of lights and giant screens. In addition to the background screen there are upright oblong or egg-shaped high-resolution screens to the very left and right. 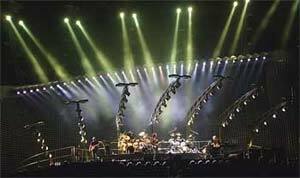 The light show is made up of numerous vari-lites installed both on the top and bottom of the stage and on several columns that reach up some 120ft. Elements of the lightshow will move up and down these columns. There were a couple of rows of chairs between the front of the stage and the mixing desk. Behind that there was a sort of office area. There was not any more space. The hall had been darkened as far as possible – the show was scheduled for 2pm after all. The first person we met was Nick Davis. He advised us to sit as far in the back as possible. The sound in the hall was a catastrophe, he said, because of the way the stage was set up and because of the echoes. Nick assured us that the sound in the stadiums is going to be very good. We would have sat in the back anyway (as far as that is possible with only seven or eight rows of seats) because the immensity of the stage really floors you. We got the impression even at that point that it would be better to see this show from “a little further away” than a reason for fighting to stand in the first row (just like Pink Floyd 1994). While we were waiting we got to talk with ‘colleagues’ from other fanclubs and even had the opportunity for some smalltalk with Dale Newman and representatives of the management. Right before the show began the tour logo characters appeared on the big screen along with an announcement which requested us to not use flash for photos, and two thirds of the audience whipped out their cameras simultaneously. The ban on photographing had been lifted by the management on short notice. They presumably did this because it is impossible to organize it and make it watertight and also because they realized only die-hard fans would look for photos and videos, while the majority of concert-goers would not even notice the material existed. A couple of TV symbols flew across the screen and finally formed a map of the world. It zoomed in on Finland, and HELSINKI appeared on the big screen. Meanwhile the band had appeared on stage and the first chord of Behind The Lines rang through the hall. The set list had DUKE as the opening song. It would be splitting hairs to decide whether it is a long version of Duke’s End or a symbiosis of Behind The Lines and Duke’s End. What is important is that this intro could not have been more powerful, fascinating everybody. It may be noted that Daryl played the lead guitar. A seamless transition led into Turn It On Again. It is much better placed at the beginning of the set and fits the tour motto well. They performed the song much more lively and powerful than on their VH-1 appearance. The set continued less than surprisingly with two hits. No Son Of Mine was a solid effort, with Mike’s guitar sounding a tad ‘dirtier’ than in 1992. Land Of Confusion was played the same way as ever. The 250 people in the audience were still so in awe of the stage and the terrific intro that they could not sing along the “oh, oh, oooh”. This will certainly be different in the stadium. On the screens there were the Spitting Image puppets that were by and by replaced by the real people (just like in ’92). After the song Phil said a few words. He explained that this was not Helsinki but the test run for Helsinki and that the band had a great history they were trying to cover. The intro to the In The Cage medley would surely have sent permanent shivers down everybody’s back. An expectant whisper went through the audience when Mike took his new double-neck guitar. Phil sang markedly lower than in 1986/87 but by no means worse. The screens came on for the first time, and showed a robot or an abstract human shape running across the screens. During the “outside the cage” bit Phil stood on a platform on the right side of the stage (as on the Mama tour). “Raindrops keep falling on my head” was accompanied by a corresponding animation on the screens. It was only confetti, not rain, falling there but it was very impressive. The transition to The Cinema Show was as usual, and it was a pleasure to hear these parts of Genesis history again. Whatever your take on medleys may be, these two piece go well together. We would not mind a complete Cinema Show, but the instrumental section is the strongest part of the song and the evidently enjoyed playing it. The switch to Duke’s Travels was a bit abrupt; this song comes in somewhere after the keyboards. Duke’s Travels makes you wonder why they did not play it live sooner. Phil does not sing the Guide Vocal reprise, but Daryl plays the melody on his guitar. The ensuing transition to Afterglow was something that can be improved in the course of the tour. It was a bit bumpy, and it seemed that the band were not a hundred percent sure how they wanted to do the transitions. Afterglow gave everybody goosebumps. Phil’s vocals were good, contrary to what many had feared. The end was as pompous as ever with Chester and Phil on the drums. The inevitable happened after this terrific highlight – Hold On My Heart. It was not that big a hit, and fans like it as much as a tax inspection. It remains a secret whatever the band sees in this song. The performance was okay, though. Phil sat on a bar stool. Home By The Sea was announced very briefly; no audience participation time anymore. The video bits on the screens reminded us of 1992, Genesis visibly enjoyed this song enormously. The instrumental part was as grand as ever with a metallic drum sound. 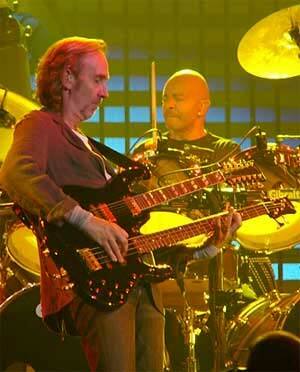 Follow You Follow Me was the ballad that made Genesis a group that could be played on the radio. The song does not come as a surprise therefore. Prog fans may enjoy the show around ist. First of all, Phil puts on the headset, sits down at his drumkit and played (and sings) the whole song at his kit. The crowd will probably not look at Phil but at the screens, across which Albert (from the Duke album) can be seen walking. This is a bit odd since Follow You Follow Me is from And Then There Were Three. Then there is the father from the We Can’t Dance album who walks up a set of stairs to his song, in a minimalistic sketch. Suddenly Nursery Cryme’s Cynthia, a couple of Trick Of The Tail characters and the lady sitting on the bench of the Selling England cover also appear. This may seem corny to some, but most people will enjoy it. It felt as if Genesis had decided to live up to their past, as if they were proud of what they had achieved in four decades of the band’s history. This had not always been so. The song was played completely before the set continued with the next song. Firth Of Fifth began as in 1998 without piano intro and vocals, but with another faster-higher-stronger solo by Daryl Stuermer. Firth Of Fifth is one of those moments where Daryl leaves his mark on Steve Hackett’s work. One need not like it, but it his right not to simply copy the original. The transition to I Know What I Like was similar to that of 1992. The big screen plays an important role again. At first, Peter can be seen dressed up as Rael. 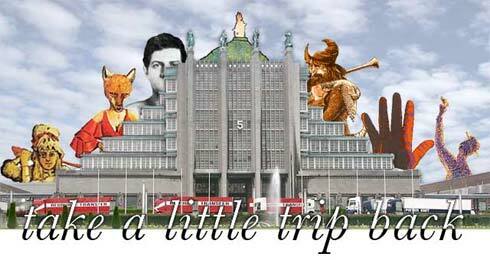 Then there is a movie bit made up of various photos and video bits of the band’s history, among them photos of Anthony Phillips, Peter wearing the Flower mask etc. The words “It’s your show!” take on a whole new meaning. In the end Phil does his famous tambourine dance – but this time his 1976 alter ego performs the same trick simultaneously on the screen behind him. I Know What I Like met with a spirited discussion amongst fans. Should it be in the set or not? In this shape it definitely is an emotional moment for fans, and the photos that come with the song are great. Who would have thought that Genesis would ever play Mama again? It was a reason for Phil’s throat problems in 1992, and Ray had his own problems with it in 1998. Surprisingly, Mama survived all rehearsals to stay in the set. Phil sings the song with a controlled voice but still quite aggressively. It seems he has found a way to sing Mama without straining his voice. A true highlight! While the band played Mama some sort of camouflage nets were pulled up and illuminated between the columns. What followed was one of the biggest highlights: Ripples. Many rumours flew around, some mentioned an acoustic version without the middle section. The song is almost complete and comes with a fantastic guitar solo by Daryl and drums. Ripples is definitely one of the big moments of the show. It is, however, allegedly a song the band are not sure about – if they seriously consider dumping this song it would be a catastrophe for the set. It was enthusiastically received in Brussels. Let us hope that the same is true for Helsinki, Herning and Hamburg – because then chances are the song stays in the set list. A real fixture in the set in the set is Throwing It All Away. Chester once called it his favourite Genesis song in an it interview. The bit where Phil has the audience echo funny noises will certainly be fun in the stadium. It even worked in Brussels with 250 people. The screens show live shots from the audience during the song. Phil had a couple of problems with the Domino principle – his left side did not really participate at first, but finally it worked even with 250 people in the hall. Domino is a light show spectacle. After In The Glow Of The Night Phil disappears as usual, only this time he is not beamed up anywhere. He stands in front of some camera so that his face appears in the “warp channel” on the screens during Blood On The Windows. The Drum Duet made for a big surprise. Phil and Chester stood facing each other, between them one or two bar stools with leather-covered seats. On these, they would drum along merrily. Phil would occasionally and cheekily drum between Chester’s sticks. By and by they would go to their drums and continue to play there – a hilarious idea! The transition to Los Endos was similar to that in 1986/87. The regular set did not end here, however. The drum computer came on right after Los Endos and the sounds of Tonight Tonight Tonight could be heard. This song was only played up to the instrumental part, while the screens showed pictures of a city. Invisible Touch was nothing special either. Strangely enough, the regular set ended with it. After a firework that soon met its limitations (i.e. the roof) in the Brussels Trade Fair Hall the guys left the stage. The drum computer then announced another worldwide hit, I Can’t Dance. The performance was fine, the lightshow excellent. The song is good fun this way when the stage turns into a sea of colours. At first it is only Tony, Mike and Phil on stage, with Chester and Daryl joining them in the middle of the song. Phil, Mike and Daryl also leave the core stage and walk along the screens. After I Can’t Dance Chester and Daryl were introduced, and Phil mentioned that they had been playing with them “for thirty years now”. 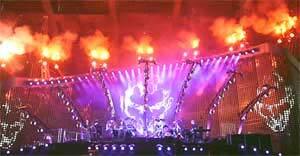 Indeed, it is thirty years … The final song of the show was again played without the introductory verse. Despite that The Carpet Crawlers are another highlight – after all, The Carpet Crawlers were played only once during the 1992 tour! After all these years of pop songs ending the set a ballad at the end of this show certainly takes getting used to. But bands like U2 have been doing it for ages and it works really well. And fans would probably rather go home with The Carpet Crawlers than with I Can’t Dance. The show lasted almost exactly two and a half hours, and the it staff quickly reached an unanimous vote: This was good, very good. It was besser than many had expected or feared. Even Mino Profumo, who consistently focuses on the era up to 1977, was happy: “It was much better than I expected.” Such comments came frequently from fans of the early years. If Genesis play this set on tour and if variations of the set list do not mean that Ripples or Carpet Crawlers are dumped one can be happy. It will also be interesting to see how stadium crowds will react to it.